Barefoot In Blue Jeans: Lucille Ball Remembered By Hollywood. Lucille Ball Remembered By Hollywood. I Love Lucy was introduced to me when I was really young, probably before I was even born! The women in my family have a crazy I Love Lucy obsession! It's a good thing. We have basically memorized all the episodes, we quote Lucy from the show all the time, and we have posters somewhere in the attic (although they should be in the kitchen or in the living room, showing our I Love Lucy pride!) We also have chocolate bars from the episode in Season 2, Episode 1: 'Job Switching' (One of the most famous I Love Lucy episodes of all time!) where Lucy and Ethel work in a chocolate factory. Or cinnamon heart candies in a bottle that looks like the 'Vitameatavegamin' bottle from Season 1, Episode 31: 'Lucy Does A TV Commercial'. A childhood memory of mine is going over to my Grandma W.'s house and sitting down on the rocking chair with homemade chocolate chip cookies (or brownies from the Pillsberry box), drinking Nestle powder chocolate milk you mix with milk watching I Love Lucy! I loved that! I still love it! Haha, only now the chocolate milk turned into coffee. 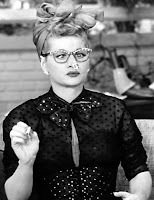 Visit this > The legendary Lucille Ball remembered by Hollywood!